The Federal government when they issued the BIG HEADED Benjamins in 1996 loudly proclaimed that they would be replaced by 2006 with a color note to stay one step ahead of counterfeiters. In the WOV forum, I posted a loud complaint about this issue. The Bureau of Engraving and Printing began printing these new color$100 notes in February of 2010 (By some measure they were 5 years late, and the BEP had spent hundreds of millions of dollars trying to perfect this design. Then they printed over a billion notes at some $200 million in production cost, only to find that they were so defective as to be unusable. The series was the 2009 series of $100 notes. Eventually 1.44 billion banknotes were printed, and we can only guess that they will all be destroyed. The BEP has now printed over 1 billion of a new series (called 2009A) and they are greatly slowing down production of the 2006A series (with George Bush's signature). At some point next year it looks like the BEP will begin circulating the new color $100 bill. Introduction will be a unbelievably difficult. Unlike a $5, $10, $20 or $50 banknote people don't begin rejecting the old banknotes in favor of the new ones. The new bills circulate quietly along with the old ones until the old ones are destroyed. Unlike most countries the old banknotes remain legal tender forever. There are between 8 and 9 billion of the old banknotes circulating. Considering that most $100 banknotes circulate overseas, people begin to demand the new notes, and eventually reject the old ones for fear of counterfeits. We saw this happen in 1996 when the BIG HEADED Benjamins were first printed. I was afraid that their might be a crisis given the length of time it was taking to produce the new notes. If rumors of supernotes circulate then people begin rejecting the old banknotes. The longer a bill stays circulating the more likely it is to be counterfeited. I suspect that some decision will have to be made in the next 20 years. This old banknote lasted 16 years so far, but not only will the 8 billion notes have to be replaced, past history tells us that the usage will increase by possibly as high as 1 billion $100 notes per year. To replace this series with new notes will be an almost overwhelming problem. The simplest solution will be to re-issue the $500 banknote to help with the replacement problem. Another possibility will be a reliable global electronic currency that people trust as much as they do physical currency. Also, one that gives people the privacy they crave for cash transactions. The anti banknote people believe that currency (particularly the large denomination) is responsible for a laundry list of social ills. Among them are drug smuggling, aiding illegal activity of all kinds including tax invasion and illegal immigration, and they present a danger to people because robbery would be less common without the ease of spending stolen cash. Most people are rabidly opposed to eliminating cash. Although relatively small numbers of banknotes in denominations were printed in the 1930's, the government did not print any in the 1938-1969. In 1969 they decided to destroy all the bills that remained in circulation that were turned into banks. The $100 denomination was considered reasonable for privacy and convenience. The decision to reissue larger banknotes again has been repeatedly rejected. Canada printed a $1000 denominated for a few years, but changed their mind and began destroying the old bills. It is not illegal to own one of the old banknotes in denominations of $500, $1000, or $10000 , but given inflation since they were printed in the 1930's even their value as collectors items have barely kept pace. I had never even heard of the new $100 bills or the printing screw-up until you had posted it on WoV some time ago. Crazy that it's taken them this long to sort it out. While searching for updated news, I found this news story about a bunch of the new notes getting stolen. Here's a surprisingly honest video from the Fed about the printing issue. They say there's no date for issuing the new currency, but that there will be at least a 6 month buffer between announcing the date, and the date of introduction itself. So we can assume we won't be seeing the new bills for at least 6 months. To your original question. GOD YES. Speaking for anyone who gambles a lot at even medium stakes and doesn't want to hassle with a casino credit account (mostly due to identity issues), $500 bills would be a serious boon for transporting your bankroll. So we can assume we won't be seeing the new bills for at least 6 months. So far the government has only produced 1 billion of the new notes. They need to replace over 8 billion in circulation without causing a run on the banks around the world. At the current rate they are can only make 1 billion in 6 months (assuming the production problems are fixed). So even with the mandatory 6 month announcement, they may not be ready for a while. Personally, I think they should wait until they have 5 or 6 billion notes made before they begin circulating them. However, I am sure that they won't be that conservative. In the summer of 1969 when they formally announced that they would destroy all high value notes in their possession, there was fewer than a single $100 note per capita circulating. A relatively small percentage were circulating overseas, and $100 in 1969 is worth much more than $500 today. Advocates of the high banknotes point out that they are keeping with the spirit of the decision in 1969. They also argue that the IRS currency reporting requirement of $10,000 currency transactions would still be in force. It just won't be so many bills. Right now there are over twenty five $100 banknotes per capita in circulation, but as many as 3/4 of them are overseas. The UK has made it illegal to buy and sell the 500 Euro note inside the country. Perhaps they would respond in kind about the $500 note. The UK circulates a fairly limited number of £50 banknotes (roughly $80). The Bank made 278 million of the new £50 banknote to get started. There were roughly 200 million of the old notes in circulation. The Bank of England circulates £ 63,601,000 in banknotes and £ 81,000,000 in coin which is just over £ 1000 per capita. A very modest amount compared to continental Europe. 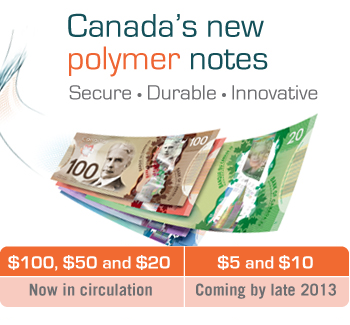 Canada began issuing the new $20 polymer note on 7 November 2012. They have already been using the polymer $50 and $100. The $5 and $10 won't come out for another year, but those denominations are in relatively small numbers in any country. Over half the notes in Canada are $20. Another possibility will be a reliable global electronic currency that people trust as much as they do physical currency. Also, one that gives people the privacy they crave for cash transactions. I don't know that I see or ever want to see this. If you want to lose your freedom fast, support an all-electronic currency system. The feds could literally starve you to death at the swipe of a mouse. And if anyone thinks they would stop at the "big" notes, they must be crazy. And if anyone thinks they would stop at the "big" notes, they must be crazy. Believe it or not, I see the coins and small notes vanishing first. Most of the public transportation systems are trying desperately to get rid of any cash transactions. Food stamps are increasingly becoming about electronic cards. The fear and desire to control illegal immigration will be a driver. Benjamins are the most profitable export. Even the new ones cost less than 20 cents to make, and they are exchanged for $100 worth of goods and services to people who have no way to retain value based on their own shaky currency and other markets like real estate which have no liquidity. Those Canadian polymer notes are so cool. I had 4 four of them mixed in with my quick-access bankroll for a while, but spent them on a return trip to Canada. I didn't try to tear them, but I did crumple them up several times each and folded them every which way, trying to leave a permanent crease. Interestingly the little transparent section showed the most wear after I was done - the main body of the note still looked almost brand new after all that abuse. We would really have something if we ever did "cancel" the old bills like Caesars might cancel old cheques. Though we could only do that once. We had that discussion on WOV. Doc said that I should not call banknotes "profitable" because they show up as a "liability" on a balance sheet. While I concede that he is technically correct, they are a liability that no one ever collects (i.e. some are turned in but that amount is always exceeded by the new ones borrowed by the international market). The United States has always maintained a position that their notes and coins are good in perpetuity. It is more of a symbolic gesture, because really old bills eventually become more valuable as collector's items than as straightforward money. Most countries print new notes, and they have a period where the old and new circulate side by side (could be 90 days or several years), then they have a longer period where the money can only be exchanged in commercial banks, followed by another period where it can only be turned into the national bank. Finally, the notes and coins are no longer valid as money, but by that point they are usually collector items. The US government would stop paying interest on treasury bonds before they would invalidate banknotes. But by then we would be rolling off the cliff. Canada has been circulating the $100 polymer note for one year now ( 14 November 2011) so I assume that people or businesses are no longer required to accept the paper notes. But I assume that any commercial bank will exchange them (after a careful scan for counterfeits). At some point the banks will no longer exchange them. But there are relatively few of them (about 1/3 billion) and relatively few circulating outside of the country. They are popular in Mexico and the Caribbean (especially Cuba). So far Canada has seemed reluctant to support it's currency as a currency of choice in international borders. Iceland has expressed considerable interest in adopting Canadian dollars to replace their own battered currency. Thing is there is nothing to "collect." Since the gold window was closed in 1971 the only thing you can get from the Feds is cancellation of a debt you owe to them. As it is, Fed loans money to a bank, bank "orders" notes from the Treasury. Treasury prints the notes and sends them to the bank. Person takes them from the bank, buys dope, and the bills go overseas. As I see it, the Fed is where the real profit is made, though when you can print money at will how can you lose money? Indeed. Currently Harper is cozying up to the Chinese with some very underhand tactics of removing Canadian sovereignty. I've just got a bunch of the new $20's for the first time this week. Was a quick double take, but they handle well. Used the $50's and $100's once... I don't tend to be paid in cash (though I purchase in cash a lot), so they are a rare thing across my wallet.